And of course, increasing numbers in our knowledge economy are working from home – Ireland is apparently a knowledge economy – pity that those who running the country didn’t seem to have much of it…But I digress! We have a wide range of standard home office desks and lots of variety (in terms of size, material and colour) in bookcases that should solve your requirements as well as having the in-house facility to make custom furniture for your personalised home office. 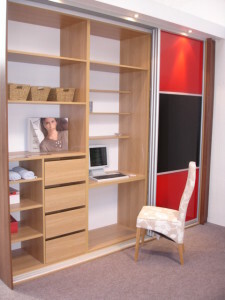 The images above give you just a taster of what is possible – in one of the images we show a sliding wardrobe come home office unit – this clever unit makes the most of the sliding doors to enable a hidden work station. Clever to have after a hard days work when the last thing you want is to have to look at the computer screen again during your relaxation time! Here’s a point I made to a customer recently – why shove your home office into a corner – if you are going to be there you don’t want to be looking at a wall unless you have to! With this in mind I’ve attached a picture of a nice “L” shaped desk with bookcase behind – a really clever way to lay out and make the office become a feature room. We’re also showing the internals of a traditional cherry desk and really that should be enough to get your appetite whetted! Simple custom desks start from €100 upwards for pre-finished, easy wipe board material. Real oak and walnut veneers (as well as many more) can also be added and mixed and hand-finished for an executive quality feel. It’s all in the customers hands! Thanks for visiting and maybe see you soon!